The new Fujifilm X70 is a big step forward from the X30 camera, and a viable alternative to the more expensive and physically larger X100T. The move to an APS-C sensor is very welcome, especially in such a small body that won't attract any undue attention. Coupled with the excellent fixed lens, the X70 is capable of producing images every bit as good as the more expensive X-series cameras. There are two things that stop us from recommending the X70 more whole-heartedly, though - the 28mm lens and the lack of a built-in viewfinder. Although offering something different to the X100T with its 35mm optic, 28mm may prove to be too wide than the more general-purpose 35mm focal length. Similarly, although the X70 would inevitably be bigger and heavier with a built-in viewfinder, we found ourselves wishing for one anyway, especially when using the focusing and aperture rings. So you really need to be sure that both of these design choices suit you before taking the plunge with the X70. We also found the 180-degree selfie mode for the LCD screen and the Auto shooting mode a little incongruous on what is otherwise a great camera for more experienced users. Their inclusion detracts a little from a very well designed control layout, especially the Auto switch which we kept using in lieu of the on/off switch. The addition of touch-screen control for the first time on an X-series camera is very welcome, though, for all user levels, and something we'd like to see rolled out across the range in future. The X70's sensor and lens are very much a winning combination, delivering outstanding image quality almost throughout the entire ISO range, which now runs up to 51,200. You'd be hard-pushed to tell any difference between still or moving images from the X70 and the X100T, so if you want excellent image quality from the smallest possible X-series camera, then the X70 certainly delivers the goods. There are a couple of notable rivals to the X70 which also use an APS-C sensor - the rather poorly received Nikon Coolpix A and the perneially popular Ricoh GR II. Neither of those cameras have a built-in viewfinder either, they both have 16 megapixel APS-C sensors, and the Nikon Coolpix A is getting a little long-in-the-tooth in digital camera terms compared to the brand new X70. 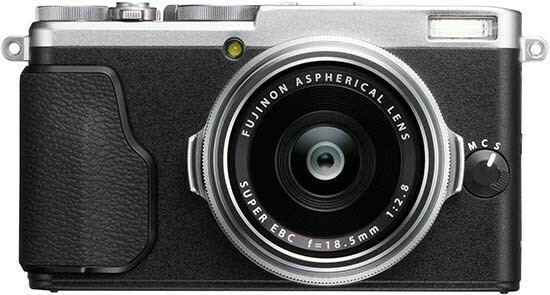 In summary, the Fujifilm X70 is an excellent premium compact camera that delivers image quality that far surpasses its dimunitive size and asking price.